The purpose of this website is to provide parents with fun eye exercises to enhance their children’s visual processing skills for better school performance and sustained attention. 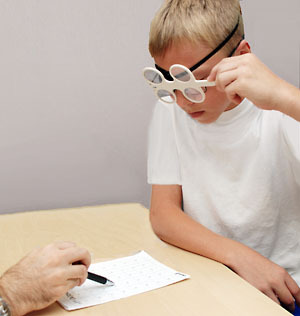 If you know a child who struggles, the underlying cause may be vision–even if the child has 20/20 eyesight. Visual processing skills like tracking, eye teaming, and visual perception are developmental skills that all children need in addition to seeing clearly. If these skills don’t develop normally, children can struggle with demanding visual tasks like reading. Each year as print gets smaller, school performance drops, and as visual fatigue sits in, children become easily frustrated and distracted. All too often, these children appear to have a learning disability or attention problems when the real culprit is poor visual processing skills. Glasses can’t help, but eye exercises can! This website will give you good information on vision-based learning problems, and we have even provided you with a great assessment tool to determine if your child is at risk. However, children do not have to have poor vision skills to benefit from these eye exercises. Even children with adequate visual processing can sharpen and improve the learning-related vision skills they already have! Please Read: The exercises on this website are not vision therapy. Vision therapy is a medical treatment prescribed by developmental optometrists and involves a much wider scope of remediation procedures involving the use of lenses, prisms, filters, and special instruments to train the visual system to work efficiently. Decades of research support the effectiveness of vision therapy to remediate disorders in visual processing. The vision exercises on this website are designed for visual enhance- ment and are not a substitute for professional care. Like any exer- cise program, we encourage you to check with your eye doctor before beginning. 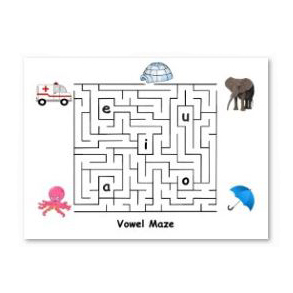 These exercises can improve and sharpen visual skills important for reading, learning, and sustained attention. However, if your child has difficulty with these activities, it could indicate there is a more significant problem. Talk to your family eye doctor or contact a developmental optometrist for further evaluation. To locate a doctor in your area, contact the national certifying board for optometrists who specialize in vision therapy at covd.org. It should also be noted that these vision exercises are not meant for children with strabismus and/or amblyopia. If your child has either condition, do not begin even a simple eye exercise program without the advice of your eye doctor. Vision therapy is highly successful in treating both these conditions, but amblyopia and strabismus require strict supervision by a trained professional. Want to learn more about vision-based learning and attention problems? Go to Eyes CAN Learn. Eye Can Learn is getting a facelift! Eye Can Learn has enjoyed a decade of providing fun exercises to help improve visual processing in children. However, it's time for a much needed facelift with new, expanded content! We're leaving the site up as we work, so you can access the pages we've already completed. The tracking section is done and we will be working on the vision perception section next. Thank you for your patience over the next several months as we work to improve our site!